With all the things getting digital now, every business revolves around the apps and, of course, over the smartphones. The ongoing demand of businesses has fostered the growth of service providers in the same ratio. All these service providers may claim to be the best among the others. However, at Sparx IT Solutions, the requirement would be served in the most affordable and genuine ways when it is about hotel booking apps & online food ordering app development. Following our legacy of adopting each fresh trend, we are proud to assist our clients with GDPR compliance solutions. Yes, you heard it right. Being an app owner, you can get GDPR consulting services from us to remain secure amid the high alert of security. We will help you cope with the obligatory terms of encrypting data, so shake hand with us to retain data safety of your mobile app users. Why are hotel booking apps a great way to get best ROI? With our hotel booking app development service, we have tried to help our clients get the maximum ROI. 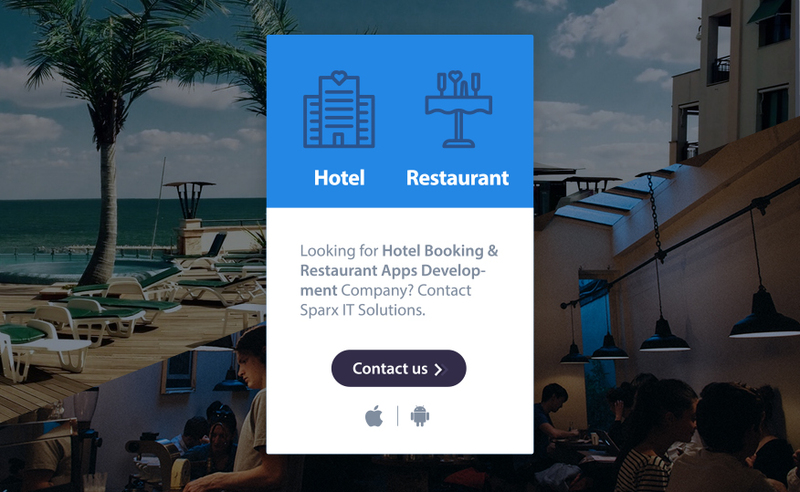 Sparx IT Solutions, offers best solution for hotel app development services so that our merchants could easily serve their clients, professionally. With our hotel booking app development services that also includes the benefit of online food booking, we are aiming to serve the respective industry to get the best ROI. We offer best hotel booking app development services to increase the ROI and number of users. Nearly 60% of the prospects have been using their mobile phones for getting accommodation while traveling via hotel booking apps. More to this, 62% of travelers use their smartphones to search for best hotel booking application. It obviously shows the popularity of these applications. Additionally, the stat for travel booking made on the internet each year is just whopping that is around 148.3 million. Today, it is all about smartphones whether you need to book a cab, get vacation booked with a hotel or trying to get your favorite food item from a restaurant through fast food ordering app. An app providing the related service is a great way to get the booking right through hotel booking apps. Great efforts are needed to accomplish the online food ordering/booking app development services and we take pleasure as one of the renowned companies providing the related services to the clients. Our online food ordering app development system focuses on the inclusion of a number of features. These features are more than enough for our hotelier professionals to offer a pleasant experience further to their clients with some serious efforts with restaurant app development. It, additionally, makes the app browsing and online food ordering experience just awesome for the users. The experienced team at Sparx IT Solutions aims to build long time loyalty with its hotel app booking services. Our hotel app development services are sure to allow hoteliers to get their presence registered in the global arena of restaurant mobile app development company. The development services for building the hotel booking app for Android enjoy the incorporation of the latest technique with a range of solutions suited for the hospitality industry that is basically into restaurant app development. We have a single unified vision of creating hotel booking applications that are easy to operate. The hotel app development services at our destination differ as per the specific demands of the clients. Our dedicated team look over the requirements related to hotel booking apps for Android in the best possible manner. Sparx IT Solutions’ lately introduced online food ordering/booking app development services help your brand reach to an extended number of clients. Our mobile app development services are heavy on features but come affordable to your pocket. One of our strategies implemented with every food ordering app development service and with restaurant app development service is to provide such an output that could satisfy clients’ respective needs. With our mobile online food ordering app development system, quality is guaranteed with the availability of the experienced developers at your disposal obviously for restaurant app development. So, We are serving to boost the business of our clients with our online food ordering/ booking app development services. We have stepped ahead with our hotel booking app development services. The aim is obviously to be the best hotel app booking development service provider by defeating our rivals in the technical sphere when we are providing hotel app development services. Our aim is to offer the following benefits along with the hotel app booking development services. The professional team at Sparx IT Solutions works on the services that come affordable for the clients. With this new hotel app booking development venture, we have maintained the flow. It is not just a fact for the hotel booking & restaurant online food ordering app development services, but we are reliable for every restaurant app development service that is offered by us. While any specific hotel room booking app is under the development phase, we try and do our best to please the clients in the most professional way. The developers at our company are quite experienced to customize the food ordering app development requirements detailed by the clients. The talented Sparx IT Solutions’ team keeps pace with the upcoming technology. That also helped us be specific with the new restaurant app development services. Restaurant mobile app developers are available with Sparx IT Solutions and thus we can offer you restaurant app developers’ services at an easy price. We have already delivered a number of projects successfully and now wishing to raise our graph. Our developers implement the features required by the clients over their food ordering app. As a result, it makes the custom food ordering development services much easier for us. Our hotel booking app & restaurant online food ordering system development services, having a bunch of benefits, will help you reach out to the millions of clients looking for restaurant booking application services. So, the applications are built specifically for respective client and thus we incorporate requirements by customizing them in the best way. Presently, the food ordering apps have been prospering well across the globe. People search for FoodPanda like apps and its clone script. There is a huge demand for online food ordering; there are a lot of startups that have evolved in India. Still these online food ordering apps (Foodpanda, TinyOwl, TravelKhana, etc.) consider that there is a huge free market to be grabbed. You must know that online food delivery market in India had grown to $1.6 billion and is still counting. Hence, the need for online food delivery apps has also increased by leaps and bounds. Getting such an app built by an app development company in India is a perfect and cost-effective solution. Thanks for showing interest in Sparx IT Solutions, we have forwarded your query to our sales team. They will approach you shortly. Hotel Booking & Restaurant Online Food Ordering apps are very competitive apps in these days. Every app owner want to promote their app. your app development company is seeming best to develop these apps. I want to contact you. can you tell me approximate cost price of app development.